Sometime ago after I finished my tutorials for Android offline map app I spent some time adding more features to the simple app, I guess I should share the code since many of those features are expected from any map application. The post here won’t contain detailed explanation about how each feature is implemented since each feature might require it’s own post. Anyway if you’ve been reading my previous tutorials everything here should be straightforward and easy to understand, consider the source code provided here as some sort of raw data that someone might benefit from 🙂 . This code is built upon the offline version of the app, so it doesn’t have web tiles support and the mapView cannot be created in xml (these can be changed easily by following the previous two tutorials). The code isn’t perfect either, it does the job though 🙂 . Changing tiles size at runtime. The post will contain lots of images so please be cautious :). Hi :), welcome to the 7th part of my tutorial on how to create offline\online map app for android. Theory you need to know. So once again it’s an unplanned tutorial and it’s about maps 😀 . Make the mapView creatable from XML. Assign a zoom level to the mapView in XML. Adding a position marker (drawable) to the mapView from XML. Add ZoomControls to the layout containing the mapView in XML. And just a note before you continue reading: you can add the mapView in XML like any other view, one difference though is that you cannot rely on using wrap_content in the view, since there’s nothing to wrap (something like text in a button for example) but this is not end of the world, you can either using fill_parent or use 0dip with android:layout_weight, only then the mapView will play nicely with other views :). So either use a RelativeLayout and put your mapView and other views in it, or use LinearLayout and supply weight values for your views. So if you’re still reading this please download the source code (along with the empty database) from MapApp 6 : Web Support since I’ll be building on the code from that tutorial. Just please remember to put the database World.sqlitedb in the folder /mapapp/ on the sdcard. Hello, welcome to the 6th part of my tutorial on how to create an offline? 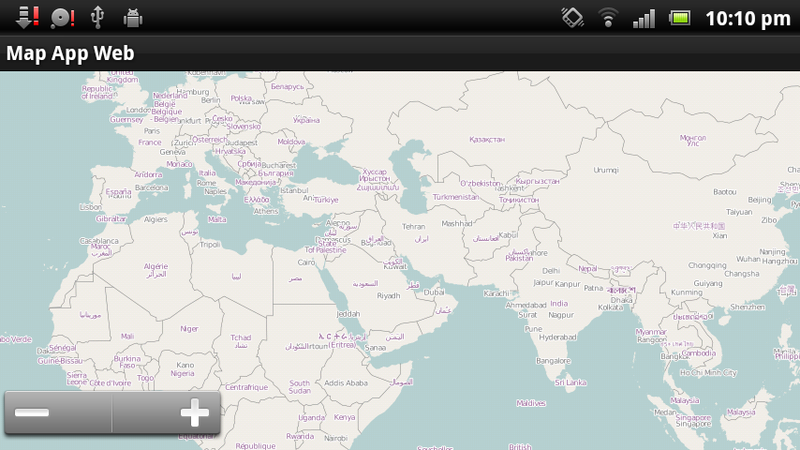 map app without using Google™ API, okay this time it’s no longer offline :D! now the app will be able to download tiles from the internet :D!. At first I planned on writing some basic tips about web tiles server support but then I realized that implementing web support needs some work and code organizing since multi threading becomes a must!. You cannot wait for the tiles to be downloaded in the UI thread!. When we want a specific tile we first search if we have it in our memory cache, if we don’t then we search in the database, if we fail to find it then we download it from the internet. It’s kind of similar to multi cache levels in a cpu, if one level fails it gets the requested data from the next level, when data found in a certain level all lower levels save a copy of the data since it’s highly likely to be asked for the same data in the near future. In our case when you don’t have a tile in memory or in database you get it from the web server and then save it in the database and keep it in memory for later use. We’ve already implemented the first two levels (Memory & database) in the tutorial part 4, the TilesProvider class covered them both. but we didn’t have any threading manipulation, this time we have to be very careful about threading stuff. We will implement new classes and modify some of the old ones, the changed lines in existing classes will be highlighted in grey. Also note that if you’re using Eclipse as your IDE you can always count on the keyboard shortcut Ctrl+Shift+O to automatically import the right packages. Welcome to the fifth and final part of my tutorial on how to create a map app for Android without using Google™ APIs :). So up until now we didn’t see any results :(, this is where everything changes :D.
MapView: a custom view to render and manipulate the map. MapAppActivity: the main (and only) activity for the app, mainly creates the MapView and handles activity state changes. MapViewLocationListener : An extended LocationListener that knows how to deal with a MapView. Welcome to the fourth part of my tutorial on how to create a map app for Android without using Google™ APIs :). So now we have a TilesManager to do all the math for us & provide us with tile indices, we still need something to give us the actual images of the tiles, this is what TilesProvider does each time our MapView asks for tiles images the TilesProvider will load the data from the Database then return them to the MapView. Each time we need to get our tiles images we fetch the data from the map database and convert the data into a Bitmap that can be rendered in our MapView, querying the database is relatively a slow operation, to make it worse, building a Bitmap also needs some time, so we must implement some sort of optimization, I’m leaving the database part and focusing on the Bitmap creation. Welcome to the third part of my tutorial on how to create a map app for Android without using Google™ APIs :). Okay, I’m supposed to show you a class diagram here but I changed my mind, since the app is simple I’ll explain each class in some lines :). Welcome to the second part of my tutorial on how to create a map app for Android without using Google™ APIs :). In this part I’ll give simple information about maps and some terms and how they are used, hopefully saving you some time of searching. Since I’m not a geography expert, please note that some information here might not be accurate, corrections are welcome 🙂 after all I’m just a programmer who learned what he needs to accomplish his goal. I’ll provide additional links for further reading at the end of this post. Earth shape : although the earth isn’t a perfect sphere, some map systems treat it as a sphere, I guess that’s okay for everyday use.